After a short absence, Absolute Memorabilia returns to the collecting mix with 2015-16 Panini Absolute Basketball. The hit-per-pack product includes four autographs or memorabilia cards per box. 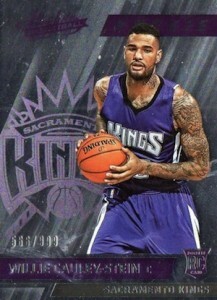 Led by serial numbered rookie cards, the full details for the base set are not yet known. However, Absolute is mostly about the hits and there are several choices across the autographs and memorabilia cards. Focusing on hard-signed content, autograph inserts include Heroes, Iconic, and Marks of Fame. 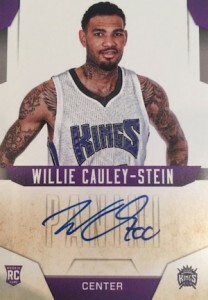 Next Day Autographs feature top rookies from the 2015 NBA Draft with on-card signatures. 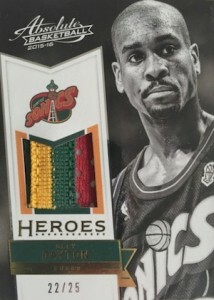 A familiar insert for collectors, Tools of the Trade memorabilia cards contain four relic pieces, including player-worn jerseys, sneakers and basketballs. Frequent Flyer relics are also available. 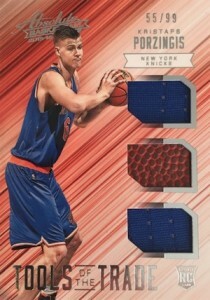 Among the non-hit inserts, Glass cards average about one per case. 200 cards, 101-200 are #/999. I wonder if this will be hobby only or retail/hobby. I believe that price per hit, this is a good way to compete. My first box contained a nice variety of memorabilia cards, 4 rookies and one auto. Next box had 4 rookies, 3 autos and a glass redemption. If your not looking for a whole wack of cards this is the way to go. Best bang for your tight fisted dollars.